They’re broken, you see. 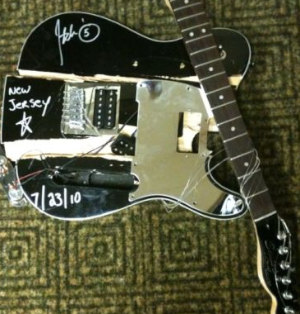 Basically, John smashes one of his Teles onstage during a show, autographs it with the date of the smashing and bungs it on eBay. In and of itself, that’s not the most awful thing in the world. It’s not like he’s Hitler or anything. However these are selling for around a grand. That’s $1000 or so for a guitar that you can buy (in one piece) for considerably less than $400 (it’s the Squier signature model he’s smashing, by the way). To the best I’ve been able to ascertain, the proceeds aren’t been donated to any charitable cause and are going to John himself who, I’m guessing, isn’t on the breadline (apologies if I’m wrong on this – happy to retract if otherwise but I’ve been unable to find anything to the contrary on John’s site). That being the case, John 5 makes around $600 a show to whack a Squier off the stage and then scribble on it. Of course, this is assuming he pays market value (or anything at all) for the guitar in the first place. Not bad. I’m quite happy with the idea of collectibles, celebrity memorabilia and whatnot but something about this doesn’t sit right with me. Does this bother anyone else or am I just being a big old square on this one? Really, there’s someone still smashing guitars? Who thinks this is cool? Yeah, I tend to agree. Whatever about the smashing though, the selling afterwards just seems a bit cynical to me. I agree that selling them just for his own profit seems greedy. Although they may “someday” become collectible, the profit margin on the original sale is high and ridiculous and would imply it will take decades if not his death to recover. I don’t even know who John5 is (John4’s younger brother?) and I collect guitars for years now. OK, so with that admission I may not be qualified to comment? Well If you owned a stage broken guitar from Hendrix or The Who you’d be in the money now. But I don’t believe they were churning them out like Bic lighters and profiteering on them ?? They are extremely rare. In summary, greedy and sensational sells but doesn’t appeal to me. I’m not entirely convinced about the extent that future worth will offset or surpass the current cost of these. Is a guitar broken and signed by John 5 more collectable and more of an investment than one he plays onstage, signs and sells without smashing to pieces? Maybe, maybe not. If I were a fan, interested in a John 5 collectable however, I know which I’d prefer.